This week Bertster was sent the most beautiful tent from the wonderful people at Houseology. If you've not heard of it before, Houseology is a beautiful online interior design store, with the most incredible ranges for your home. 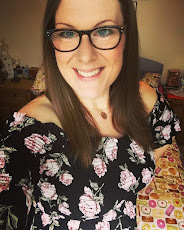 I've been a huge fan of their site for a long, long time and have followed their social media channels ooh-ing and ahh-ing at all their stunning pieces for months - so I was more than thrilled to collaborate with them for this review. In his homemade tent - watching his Kindle with his soft animals. Where's Bert? 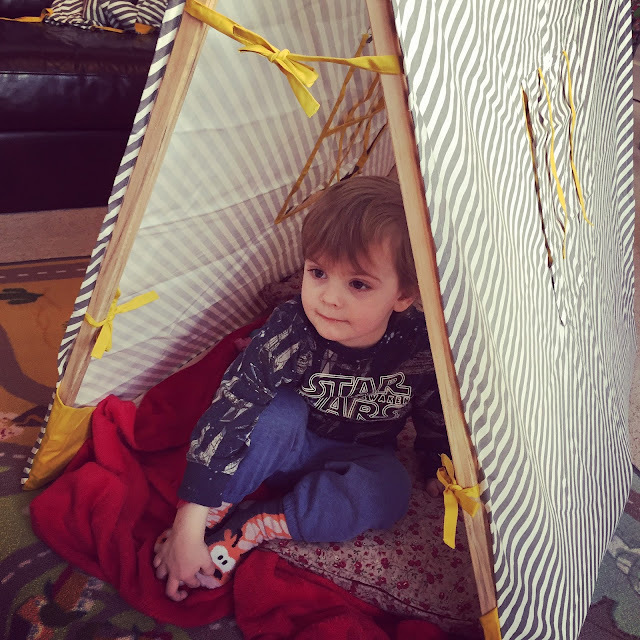 ...Reading in his homemade tent. As much as building dens and tents is really fun as a child, it doesn't quite have the same effect as a proper, real-life, fit for purpose tent - with a stable roof, and plenty of room. So when Houseology sent us out the brilliant Ferm LIVING Kids Tent we were more than just a little bit excited. Over the weekend I showed Bert a picture of the tent and told him that the postman would be bringing it for him as a special treat on Monday. Lo and behold as soon as he woke on Monday morning he said "postman bringing my tent today Mummy!" - toddlers don't miss a trick. Every time the doorbell went on Monday he cheered "My tent! 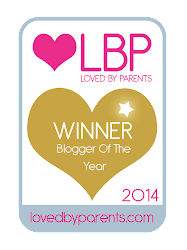 Hooray!" just to be disappointed with other parcels and visitors etc. Thankfully, by 10am it had arrived, and by 10.15am he was inside his new abode with about a million soft toys! The tent comprises of 6 meter long wooden batons and two further batons (for the top) which are joined by hinges. Then there's 8 'L' shaped plastic joins and then the beautiful 100% cotton canopy/cover. It's all packaged neatly into a matching cotton drawstring bag and comes with very easy to follow instructions. I had the tent frame up in less than five minutes, and hubby helped me to secure the canopy over the frame - at 24 weeks pregnant that's not bad - and reiterates how straight forward it was to put together: not a single swear word at impossible instructions or messing around with tools etc. Fab! T'ah D'ah! Bert was more than chuffed with his fabulous new tent. Bert was cheering and squealing with delight as he watched me put up his tent...we lined the floor inside with blankets and cushions and he dived straight inside! 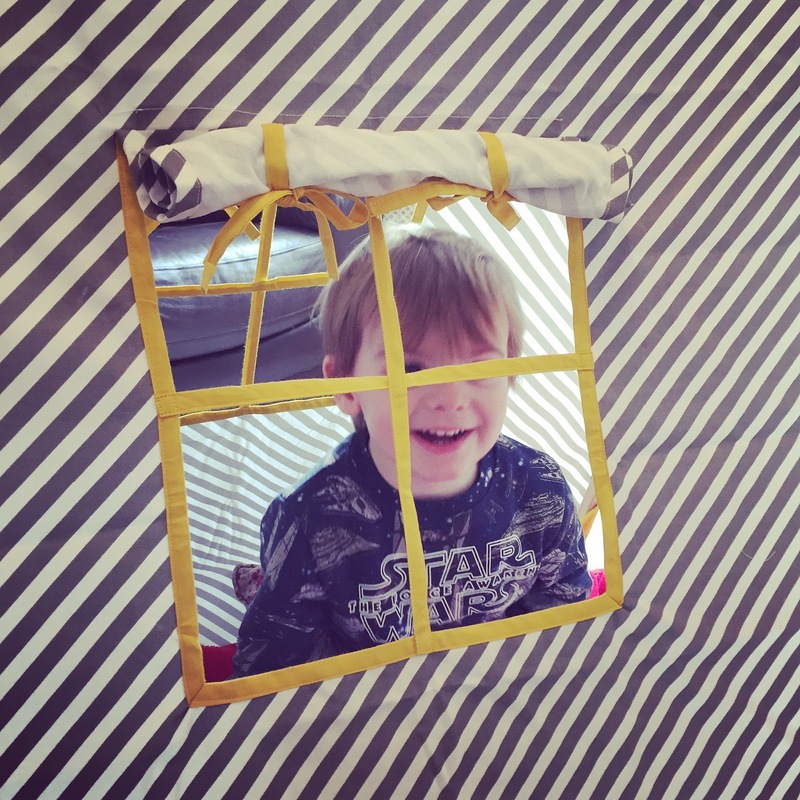 The tent has window openings on either side, with little blinds that roll up and secure with ties. 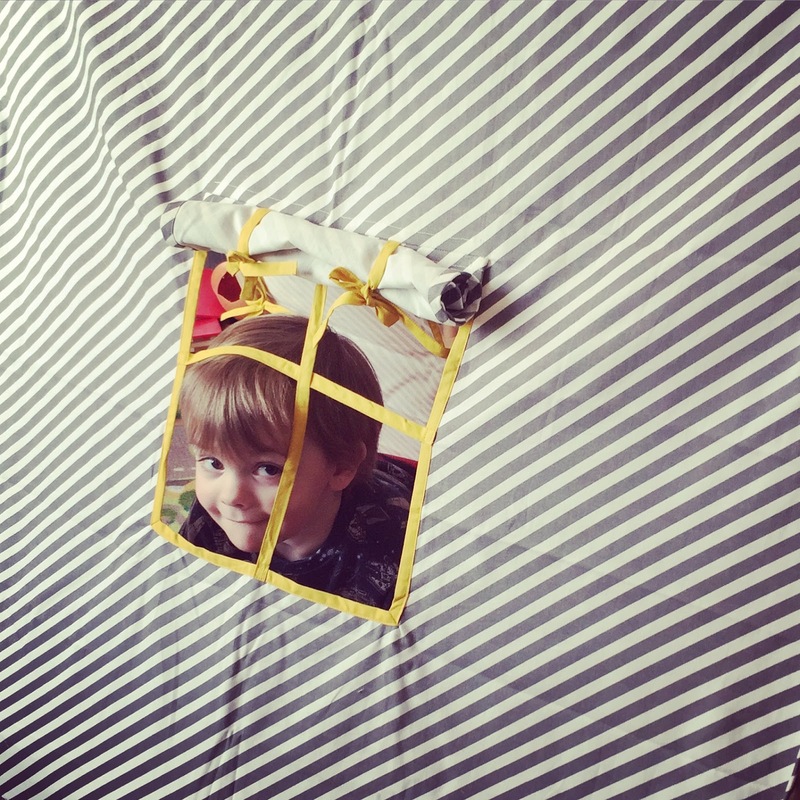 There are also ties to help secure the cotton cover to the frame and keep it balanced. Our tent is the grey/white stripe with yellow detailing version (grey and yellow is one of my favourite colour combos!) so not only does it delight Bert, but it's also extremely pleasing to the adult eye and makes a rather beautiful and impressive feature in the room. It's not gaudy or gender specific - just practical and beautiful. 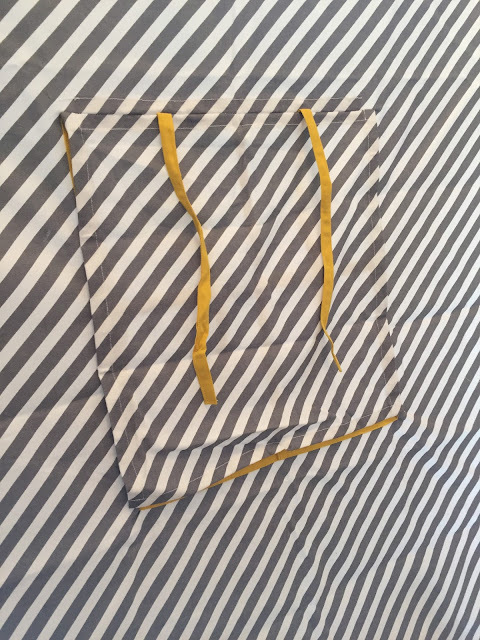 The tent is also available in a black/white stripe colour way with coral detailing. I can't tell you just how impressed I am with the quality of this piece. 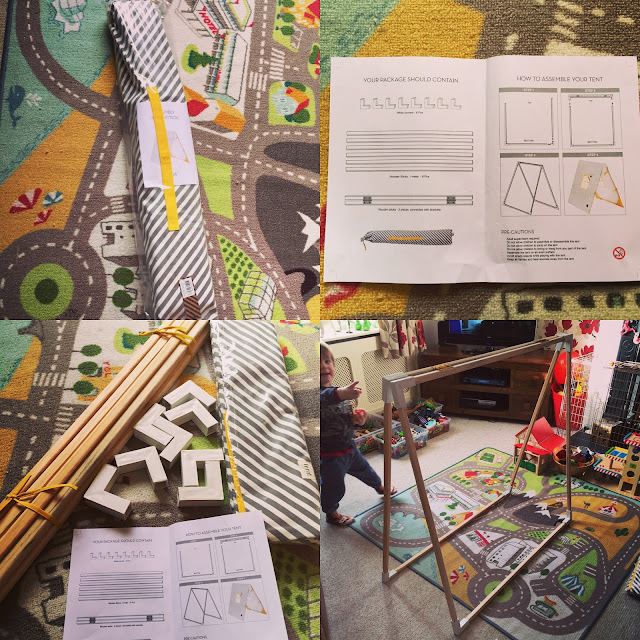 At £119 I know that it is most definitely at the high end of the play tent market price range, but in my opinion it is worth the extra spend. It is so beautifully crafted, sturdy and wonderfully presented that I wasn't remotely disappointed. Pair that with a) how easy it is to put together and b) that it folds flat, or collapses completely and can be popped away in its drawstring bag, and I honestly think it makes for the best play tent you'll ever buy! Your children won't grow out of it in terms of it's look - it's not themed to a specific character, or phase of childhood - I could see Bert enjoying this as much when he's 10 as he does at 2.5. 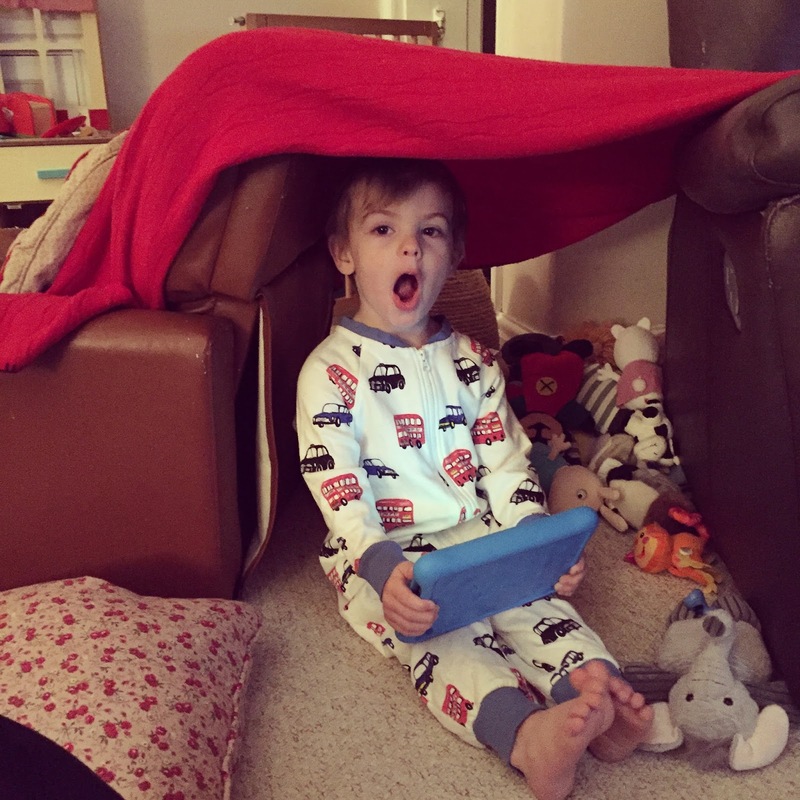 Little Bert in his fabulous new den. That's better than blankets over the armchair, hey Bert? 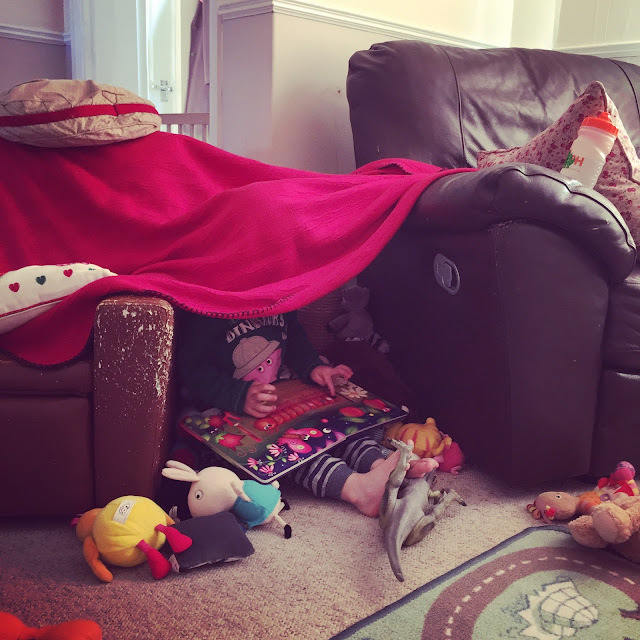 Once Bert has gone to bed and we want to turn our living room come play room back into an adult space again, we simply fold the tent and slide it in behind our armchair, ready to get out again in just a few seconds the next day. 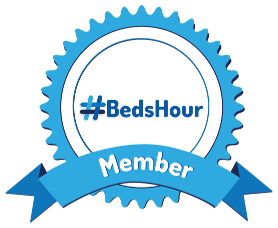 It would slide easily under a bed or could be a main feature in a child's bedroom or playroom, staying up all the time. Joined by 1000 soft toys...naturally! 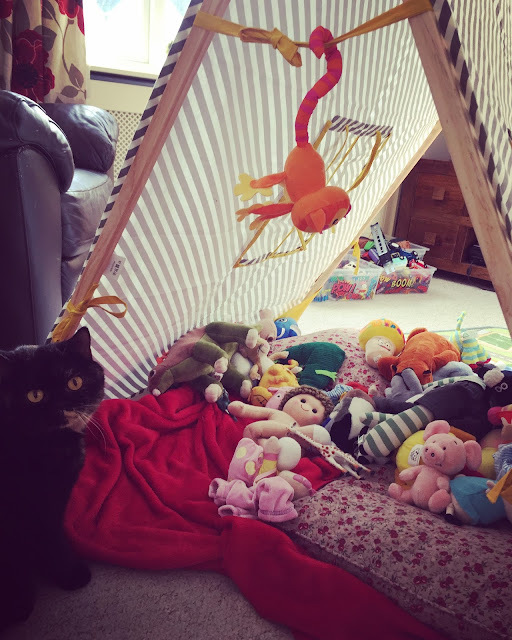 Pickle our British Shorthair wanted in on the new tent action! 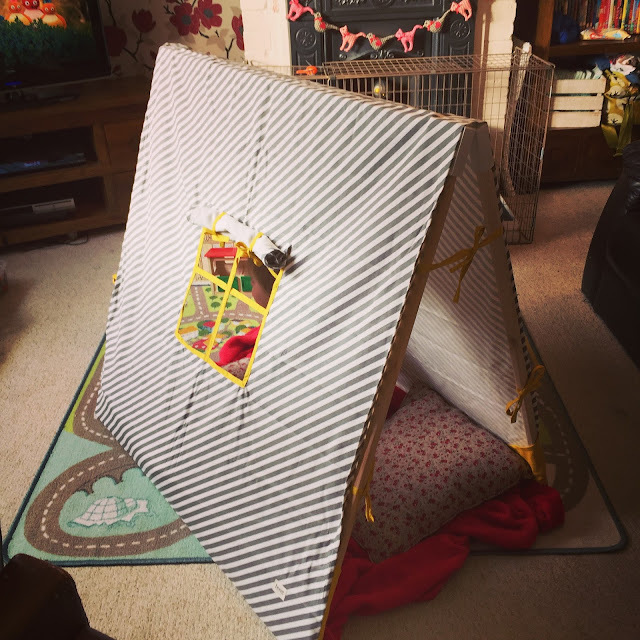 It occurred to me how wonderful this tent will be in the spring/summer months when we want to play outside, I can just picture Bert eating a picnic inside it in the garden with his friends, or his new baby sister (when she arrives) keeping out of the sun underneath its shade. Come on summer! Nappy only time in his new favourite place. Needless to say, any time we've spent at home this week has been spent inside the tent. It is the first thing he asks for when he comes down in the morning, and Daddy has to come straight into the tent when he arrives home from work at night. The novelty most definitely hasn't worn off yet. 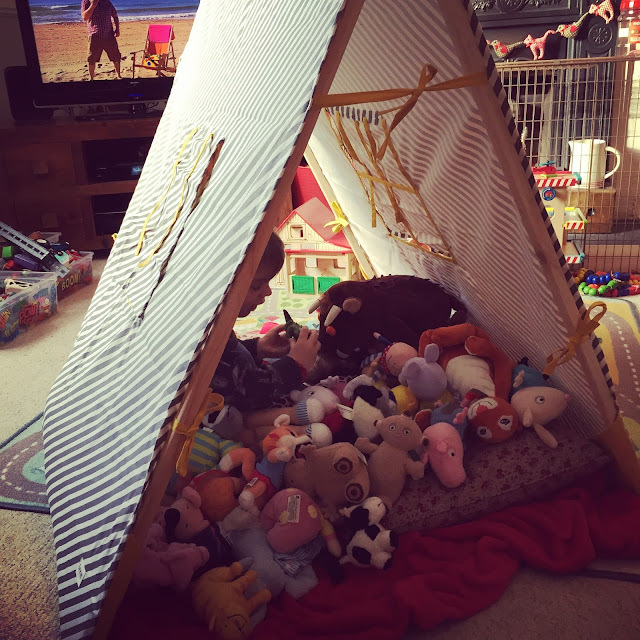 He loved having friends round to play this week, and hiding in the tent with them. Seeing little people's faces when they're confronted with the tent is wonderful - their eyes light up! I'm almost a bit jealous, I'd have loved this as a child myself. "Welcome to the Puppet Show to the Dinosaur!" hahaha, bless him! 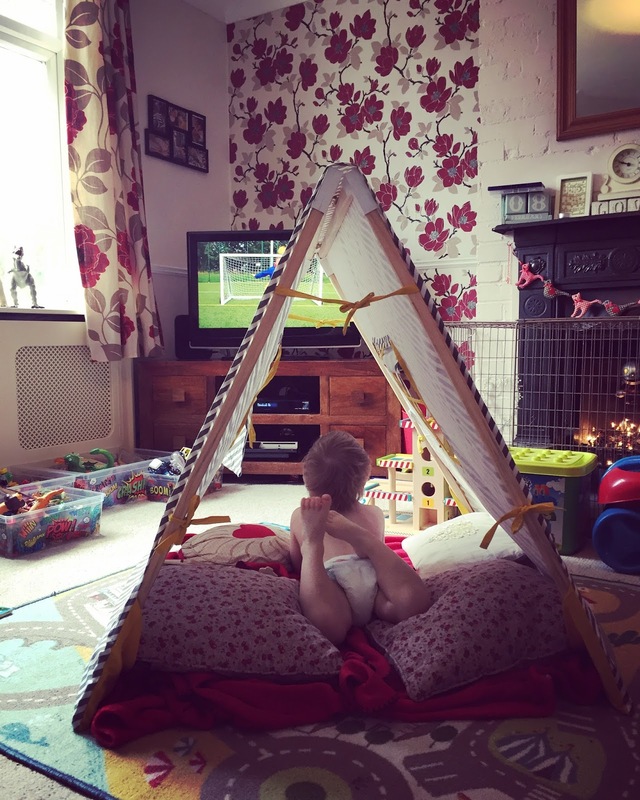 If you're in the market for a super play tent for you little ones, grandchildren, nieces/nephews and you've got the budget for this, then go for it! It will make a wonderful investment and watching their little faces when they see it for the first time will be priceless. I'm off to eat my lunch now, in the tent of course! 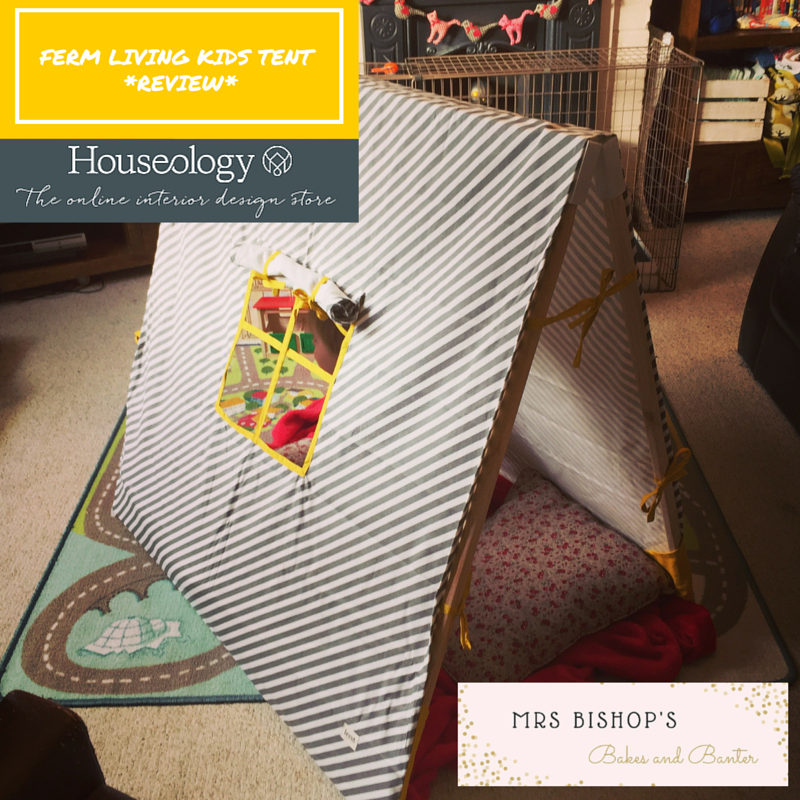 Disclaimer: I was sent the Ferm Living Kids Tent from Houseology in exchange for a fair and honest review. All words and images are my own.